The calcaneus is the largest bone in the foot. Pain in the heel region can sometimes be related to Plantar Fasciitis, inflammation of the plantar fascia ligament in the heel area. A heel spur is a hook of bone that forms on the calcaneus where the plantar fascia attaches. Heel spurs can be identified with an X-ray. A heel spur can occur with or without Plantar Fasciitis. Early signs of heel pain are usually due to plantar fasciitis, the inflammation of the plantar fascia. 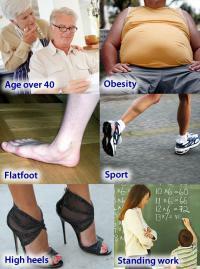 It is probably the most common cause of heel pain seen by the podiatrist. It is seen in all groups of people; runners, athletes, weekend warriors, people who have jobs requiring a fair amount of standing, walking, or lifting, and those who have recently gained weight. The pain most often manifests itself after periods of non-weight bearing when the plantar fascia is given a chance to rest, so your first steps cause a sudden strain to the tissue. Pain is most common with the first steps in the morning and after periods of rest. Fortunately, upwards of 80 percent of those treated early do remarkably well with conservative therapy. The Heel Spur itself is not thought to be painful. Patients who experience pain with Plantar Fasciitis are suffering from inflammation and irritation of the plantar fascia. This the primary cause of pain and not the Heel Spur. Heel Spurs form in some patients who have plantar fasciitis, and tend to occur in patients who have had the problem for a prolonged period of time. While about 70 % of patients with plantar fasciitis have a heel spur, X-rays also show about 50 % of patients with no symptoms of plantar fasciitis also have a heel spur. Diagnosis of a heel spur can be done with an x-ray, which will be able to reveal the bony spur. Normally, it occurs where the plantar fascia connects to the heel bone. When the plantar fascia ligament is pulled excessively it begins to pull away from the heel bone. When this excessive pulling occurs, it causes the body to respond by depositing calcium in the injured area, resulting in the formation of the bone spur. The Plantar fascia ligament is a fibrous band of connective tissue running between the heel bone and the ball of the foot. This structure maintains the arch of the foot and distributes weight along the foot as we walk. However, due to the stress that this ligament must endure, it can easily become damaged which commonly occurs along with heel spurs. Conventional treatment for heel spurs typically includes rest, stretching exercises, icing and anti-inflammatory medications. Many people find it difficult to go through the day without some sort of routine activity or exercise, and this prolongs the heel spur and forces people to rely on anti-inflammatory medications for a longer period of time. This can be detrimental due to the many side effects of these medications, including gastrointestinal problems like leaky gut, bleeding and ulcer symptoms. When chronic heel pain fails to respond to conservative treatment, surgical treatment may be necessary. Heel surgery can provide relief of pain and restore mobility. The type of procedure used is based on examination and usually consists of releasing the excessive tightness of the plantar fascia, called a plantar fascia release. Depending on the presence of excess bony build up, the procedure may or may not include removal of heel spurs. Similar to other surgical interventions, there are various modifications and surgical enhancements regarding surgery of the heel. Are Fallen Arches Flat Feet? chantellleyden is using Hatena Blog. Would you like to try it too?